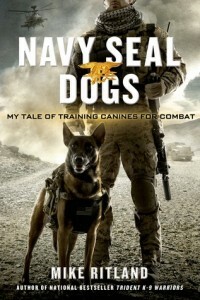 Navy SEAL Dogs: My Tale of Training Canines for Combat, by Mike Ritlan, is actually one of many 'bonus books' that don't quite fit my 2016 (Blended) Reading Challenge but which I'm reading for personal &/or novel research. I waffle between 4 & 5 stars on this one. I enjoyed every bit while I was reading it, but – and perhaps this is just the nature of non-linear nonfiction for me – I could still easily put it down and not feel compelled to finish until I had a bit of free time to work on it some more. Perhaps a personal bias. I love the topics (dogs! Any dogs, but especially working dogs! And dog training...and the special bond between dogs and humans...and true tales of both human and canine heroism...) and am currently researching working dog training, so it was of particular interest to me. I think it was just less gripping than the topic had me anticipating because it's mostly short vignettes of individual dogs or military operations. Easy to read for a minute and set down again. Some people seem to complain that it's heavy on dog training technique, but that was a plus to me. I was kind of disappointed that there wasn't more, as it was mainly just the earlier section of the book describing the author's journey into professional training. Most of the book shared personal stories of various MWD (military work dogs) and their handlers – every one a touching tale. I enjoyed that Ritlan followed the dogs after retirement, and I really appreciated his explanations of the special requirements these canine vets need after experiencing active duty. I found a new charity worth exploring (Warrior Dog Foundation), and, to my surprise, I enjoyed the closing 'history lesson' of canines in the military. I learned a lot from this book, and it was an enjoyable and easy read. I'd recommend to anyone with an interest in dog, dog training, or the military.